“Old Engine Oil is strong and dark but wickedly smooth. Chocolate dominates the palate but is nicely balanced with a hoppy bitterness. Old Engine Oil is a delicious post-prandial beer with a bittersweet aftertaste. I found the Old Engine Oil to have the following characteristics. Appearance: Thick and black. Good foam and lacing. Aroma: Chocolate and sweet, roasted malt. Taste: Fantastic chocolate taste with a full-flavored mouth feel and a slightly bitter finish. This was a great find. I liked it so much that I bought two more bottles for a recent Frothy Friday drinking session with G-LO. Sorry Wookie. When you are out of the country, you are out of luck. I would like to try this using the flip flop bottle openers I’m bound to order today! This was an absolutely delicious beer! Besides being a beautiful pour, it was also incredibly rich and flavorful. Coffee and dark chocolate notes coupled with a smooth and creamy texture. I would put it up there with the Great Lakes Edmund Fitzgerald Porter as a favorite every day dark beer. 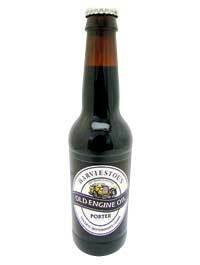 Is the Old Engine Old a Porter or a Stout? The website isn’t very clear, but you know, I don’t really care. All I know is that I look forward to having this again. Great stuff! I agree this was a great blend with more chocolate than coffee (which I prefer) and was flavorful without being too heavy. As to whether it is a Porter or a Stout, the Beer Advocate labels it an English Porter, RateBeer labels it an Old Ale, BeerPal calls it a Scottish Ale and internetwines says it is a beer made in the spirit of barley wine. So, that clears things up. On tap at the Beneluxx Tasting Room (33 South 3rd St. – between Market & Chestnut) … just saying. How does your Friday look? Good, but not for a trip to Beneluxx. Will be paying a visit to Mrs. and Mrs. Alemonger and their offspring (with my Mrs. and offspring of course) at the shore. He promised me some of that Mazda 3 Old Engine Oil. How could I refuse an invitation like that? I LOVE beers with that dark chocolate/coffee taste. I haven’t heard of this one, but I must try! I’ve actually had this one, and it is a very tasty beer! Nice find and great review LD! Good pick-up. One of the better classic English Porters. I tried to make some in my Mazda by not changing its oil for 20something thousand miles but it didn’t come out as planned. I think the primary fermentation temp was a tad too high. If anybody else said this, I’d take it as a joke, but given that it’s coming from you, I suspect that you’re serious. And FYI, you really should take better care of your car. I’m actually a little concerned for you. This is now the second review that hasn’t resulted in some sort of soul crushing. I would have thought that your meds were correct but then you mentioned craft brewing in an automobile so that can’t be it. In any event, thanks for the positive feedback and I await your further comments on the interwebs. If you can find them, Harviestoun makes barrel-aged versions of this – using Highland Park casks. They’re a bit pricey (especially for the ones using 30/40 year old HP casks), but they are quite good!